For all the gluten-free and dairy-free readers this rich, decadent dairy-free, Gluten-Free Chocolate Bundt Cake is for you! This is a cake that you will want to bake all year long whenever you get that chocolate cake craving! Go ahead, reach right into that computer screen with your fork and take a bite. 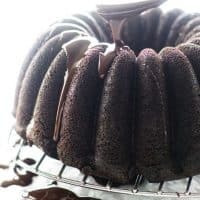 Taste and see if this isn’t the best fudgy gluten-free chocolate bundt cake that you have tasted! This is a dairy-free, gluten-free chocolate bundt cake. 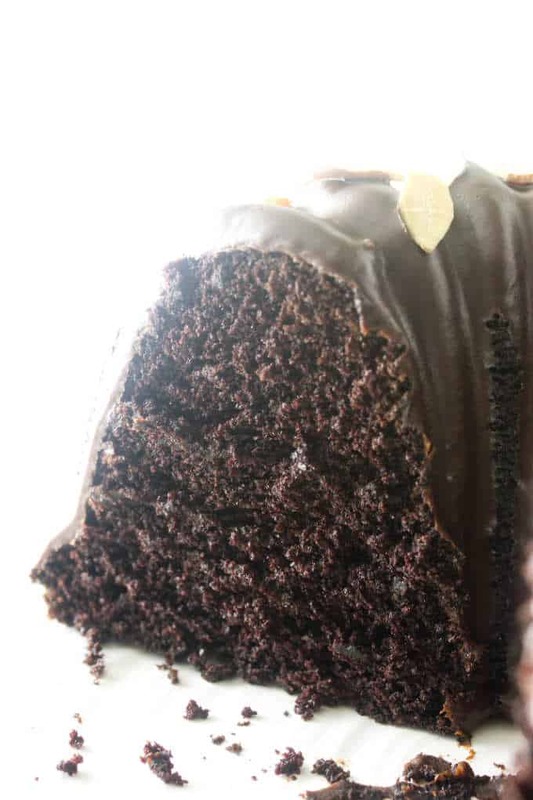 Not only is the fudgy bundt cake gluten-free-dairy free but that ultra-amazing ganache is also dairy free! Yep, that’s right…no cow cream! We used coconut cream instead. 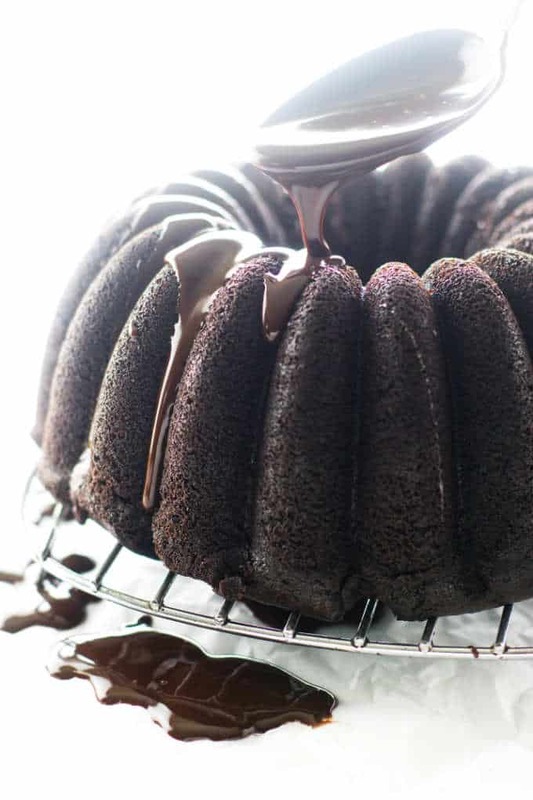 This cake originated from our Intense Chocolate Cake which was then adapted into our Gluten-Free Chocolate Cake and finally morphed into this fudgy, dairy-free, Gluten-Free Chocolate Bundt Cake with ganache glaze. Both the cake itself and the ganache are really easy. We started off with mixing hot coffee with the cocoa powder and letting it cool. 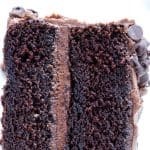 This cake is amazingly chocolaty with a whole cup of cocoa powder that produces a deep, rich fudgy flavor. Then we measured out our gluten-free baking mix and the dry ingredients into a mixing bowl. The gluten-free flour mix you use is really important. You need to use a flour blend that has several different types of flour. This cake will not turn out if you use coconut flour or even almond flour. 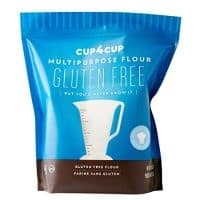 Some flour blends that work really well are Bob’s Red Mill Gluten Free 1 to 1 Baking Flour or Cup4Cup Gluten-free flour blend and Pamela’s All Purpose Gluten Free Flour. If you have allergies or sensitivities to rice then our Ancient Grains Gluten Free Flour Blend will work very well for this cake. That isn’t to say that other flour bends will not work but we tried to test this cake with flour blends that are readily available in most grocery stores. Choosing the right type of gluten-free flour blend is the most essential step for success. Ok, now that we got that little rant out of the way, we can carry on. Next, we mixed up the wet ingredients including milk, eggs, oil, and vanilla then blended them into the dry ingredients along with the cooled chocolate mixture. We baked the cake in a 10-cup bundt pan for a total of 55-minutes then, after the cake cooled we drizzled it with ganache and sprinkled it with toasted almonds. 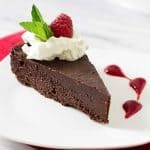 To make the ganache we added four-ounces of chopped semi-sweet chocolate to a dish and poured hot coconut cream over it. When the chocolate was soft we stirred it to blend into a smooth mixture and spooned it over the cooled cake. Can You Use Chocolate Chips To Make Ganache? Real chocolate is dairy-free. 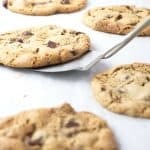 The popular brand of chocolate chips that you would use to make chocolate chip cookies has milk added to it. In past instances we have used these famous chocolate chips and they make a respectable ganache. For the ganache in our recipe we used the Baker’s semi-sweet squares. If you’re as passionate about you’re chocolate as we are then we recommend that you skip the chocolate chips and use some good quality chocolate. A good quality chocolate ganache will be smoother and taste so much better. 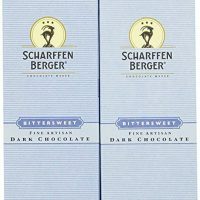 This is another quality chocolate that we recommend. For the dairy-free ganache we used the solidified cream from a can of coconut milk. This is the only dairy-free cream substitute we have tried and can recommend. The coconut cream is thick and behaves the same as heavy cream in our ganache with an undetectable taste of coconut. It makes a really good ganache! If you have been dairy-free for a while I am sure you have found a milk and cream substitute that you really like. Our favorite dairy milk substitute is almond milk. However, we pass up the sweetened or flavored varieties. Just the plain, unsweetened almond milk variety. Even though this is a super moist cake, gluten-free flour will make your cake dry out faster. That is just the nature of the flour. If you don’t plan on eating this cake right away, seal it in an airtight container. If you’re not going to eat the cake within two days of baking it, you really should freeze it. That will help prevent it from drying out. You can freeze the cake for up to four months if you keep it well sealed. You will be so amazed at how moist and tender this dairy-free, gluten-free chocolate bundt cake tastes. It will be a great recipe to keep in your recipe files and bake anytime! 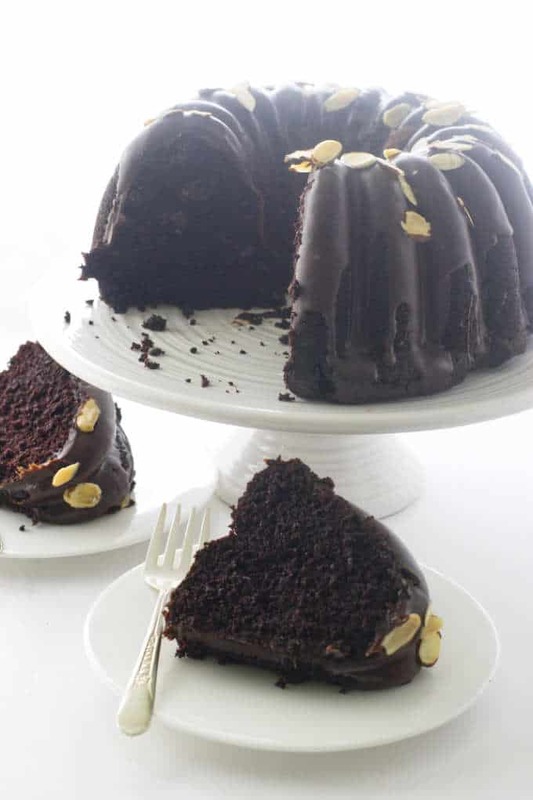 A Gluten-free Chocolate Bundt Cake that is also dairy-free. A deep, rich, fudgy bundt cake made with gluten-free baking mix. 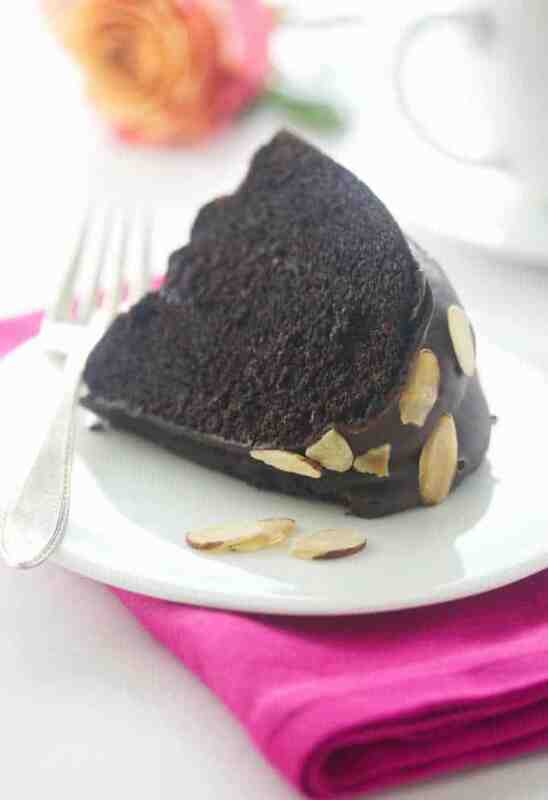 The drizzle of thick ganache is also dairy-free and made with chocolate and coconut cream. In a medium size dish, whisk the hot coffee and cocoa together until smooth. Set aside to cool, about 5 minutes. While the chocolate is cooling, add the sugar, gluten-free flour, baking powder, baking soda, and salt into a mixing bowl, whisking to combine. To another bowl whisk together the eggs, almond milk, oil, vanilla and the cocoa mixture and add to the dry ingredients. Mix on low speed for 30 seconds until the dry ingredients are moist. Increase the speed to medium and beat for 1 minute. Scrape down the sides and beat for another minute. inserted into the center comes out with a few crumbs. Remove the cake from the oven and set on a cooling rack and let it cool for 5 minutes. Turn the cake over, let the pan remain for 5 more minutes then lift the pan off and let the cake cool completely. In a small saucepan over medium heat, add the coconut cream and corn syrup and bring to a simmer, stirring to combine. Remove from the heat and add the chocolate, cover the saucepan and let stand for 5 minutes to soften. Stir the mixture until it is smooth, then stir in the hot water until the glaze is shiny and pourable. Set the cooling rack with the cake on it over a piece of parchment paper and spoon the chocolate ganache over the top. Do not spread the ganache with a spatula as it will not be smooth and shiny. Let the cake sit at room temperature until the ganache is set before transferring to the refrigerator. We used Hershey’s 100% Natural Unsweetened Cacao powder which is gluten free. Do not use the Dutch processed cacao powder as the processing neutralizes the cacao and it does not react with the baking soda. Adding coffee to the cocoa powder enhances the chocolaty flavor in the cake. However, hot water can be substituted of hot coffee. We used Baker's squares which is gluten free, dairy free. For a dairy free cream place a can of full-fat coconut milk in the refrigerator for one hour. The cream will rise to the top and can be skimmed off. Any unused portion of the cream can be transferred to a lidded container and refrigerated or frozen. Wow, this looks luscious! Hard to believe this is a gluten-free cake — looks so moist and tender. I know just who we’ll make this cake for, too — a really good friend who can’t tolerate gluten. Thanks!